Fluff & Tuff Tico Sloth is an actual Sloth, never before have we seen a Sloth toy for dogs', FANTASTIC! Tico has a wonderful fluffy body with long arms and legs and that classic 'slothy' look, he's great! 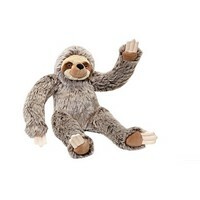 Sloths are known for their slow movements, they take their time in life. Your dog can teach Tico how to move that bit faster, swinging through the air with the greatest of ease, being caught by one his lovely long limbs and enjoying a free life where hanging around isn't his future, he longs for this new life! Tell your friends, Tico has landed! The Fluff & Tuff Tico Sloth has double-stitched reinforced seams, sewn eyes, durable mesh inner lining for the under amour and a non-toxic fibre stuffing for your dog's enjoyment.